DYNASTS OF LYCIA. Mithrapata. Circa 390-370 B.C. AR stater. 9.78 gm. 29 mm. 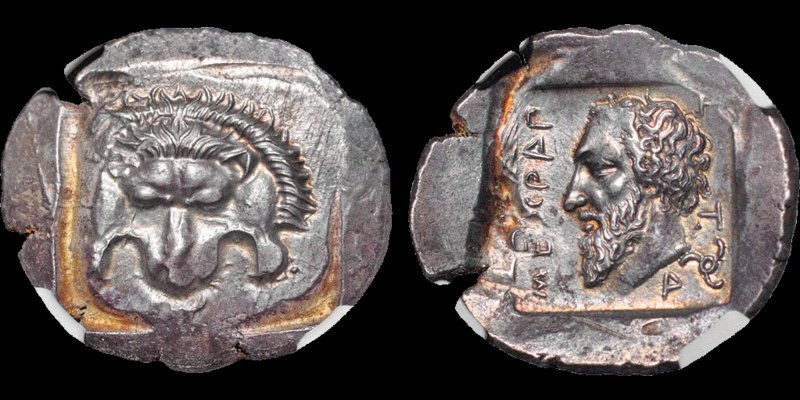 Facing lion's scalp / Bearded head of Mithrapata left; MITHRAP-A-T-A in Lycian around, triskeles to lower right; all within incuse square. Mildenberg, Mithrapata 10 (O6/R7). Podalia 75–83 (A7/P7). Falghera 193. SNG Ashmolean 1201 (same dies). SNG von Aulock 4239 (same dies). SNG Copenhagen Supplement 473 (same dies). Boston MFA Supp. 225-6 (same dies). Mint State; NGC Graded MS, Strike: 4/5 Surface: 4/5; well centered and well struck on a broad flan; fresh surfaces, lovely old toning, golden luster around the devices; overstruck as usual for issue. Rare. Gorgeous coin. Ex Triton XVIII (6 January 2015) lot 684. From the Patrick H. James Collection. Ex CNG Auction 60 (22 May 2002) lot 839. Ex Spink 155 (3 October 2001) lot 26.